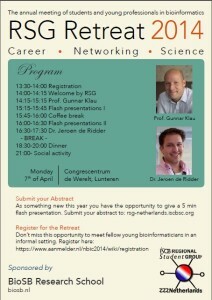 RSG Netherlands is pleased to invite all young researchers to the RSG retreat 2014 on April 7th, 2014. Like previous years the retreat will be hosted in Lunteren, directly preceding the Netherlands Bioinformatics Conference 2014 (NBIC2014). This years retreat provides you the unique opportunity to present your research to fellow students and young professionals. This informal and casual session will consist of a series of selected 5 minutes flash presentations. An inspiring CV talk will be given by Prof. Gunnar Klau, group leader algorithmic computational biology at the CWI. The second invited speaker is dr. Jeroen de Ridder, Assistant Professor at the Bioinformatics group of Delft University. Jeroen will present “10 simple rules to complete your PhD” sharing valuable experiences in starting a scientific career. In the evening there will be a dinner in the centre of Lunteren, followed by a fun social event at the conference centre bar. The evening program provides you the opportunity to network with fellow young bioinformaticians. You can find more information about the programme and registration at the NBIC2014 conference website. 2014 February 11 in RSG.